I am thrilled to announce that 20/20 Sports Experience held its first event with members of the Lighthouse SF on August 5th, 2017! 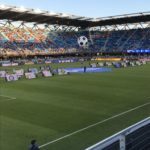 I want to recognize and thank Marissa Silver and the San Jose Earthquakes for their incredible generosity. 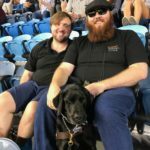 The team donated tickets so that 20/20 Sports was able to take a two members of the Lighthouse community to their first live soccer match. 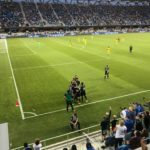 We had the opportunity to catch all the action from second row seats and were treated to a thrilling match between the Quakes and the Columbus Crew. The energy was electric and the supporters (especially the “Ultra’s”) were in full force with their chanting and cheering. 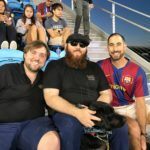 The Earthquakes broadcast their matches on the radio, which is a perfect supplement for visually impaired fans who wish to follow the game play-by-play. The combination of radio broadcasting and monocular/binoculars made the experience much more interactive for our group. 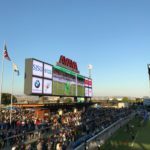 We are excited to continue supporting the San Jose Earthquakes and look forward to attending more matches in the future! 20/20 Sports Experience and the Lighthouse are off to a great start! Next PostNext 20/20 Sports goes to SF Giants baseball game!